A review of Yang Weizhen (1296-1370) and the Social Art of Painting Inscriptions, by Liu Ai-lian. Painting inscriptions are a demonstration of two of the “three perfections” of Chinese literati art – poetry and calligraphy – contributing to the third of the “three perfections,” the painting that they are written on. The idealistic notion that the three are a harmonious entity conceals the intricate relationship between inscriptions and paintings that could in fact be anything but a unified expression. What admirers of literati art have often overlooked are the dynamic, even contradictory social relations embodied in the act of inscribing a painting. Focusing on the works of Yang Weizhen (1296-1370), a leading scholar, writer, and calligrapher of the late Yuan dynasty (1279-1368), Liu Ai-lian’s dissertation explores the social dimensions of Chinese literati art, a field pioneered by James Cahill, Craig Clunas, and Bai Qianshen, among others, who challenged myths of the high-minded literati or “scholar officials” in traditional China and their self-expressive art. As the central figure of Jiangnan literati society, whose inscriptions were most desirable for painters and patrons at his time, Yang serves as the ideal subject for the inquiry of the dissertation. Rather than writing a biographical or socio-historical study, however, Liu starts with specific art objects and analyzes various facets of the act of inscribing by Yang and his contemporaries. Liu argues with great detail that the social dynamics of inscribing a painting are far more complex and intriguing than they may at first appear. In many cases, inscriptions aggressively intervene in the pictorial space, creating a “visual clash” (p. 65), and sharing or even dominating the reception of a work of art. Consequently, the role of the picture in a handscroll or hanging scroll, the most typical formats of literati art, may no longer be as central as modern viewers have supposed. The three scrolls, of which Liu provides in-depth analyses, represent different modes of text-image relationships set within diverse social backgrounds. Zou Fulei’s A Breath of Spring (1360), the focus of Chapter 1 and a familiar work to students of Chinese painting, has been extolled for its extraordinary composition and brushworks, while Yang’s inscription, added in 1361, has been studied as a major work of his calligraphy. Liu reads the juxtaposition as an exciting and subtle artistic dialogue between the painter and the calligrapher/inscriber. As Liu points out, Yang’s calligraphy evokes the emotional works of Northern Song poem-scrolls, such as those produced by Su Shi (1037-1101), Huang Tingjian (1045-1105), and Mi Fu (1051-1107). The dramatic style, however, sharply contrasts with the conventional tone of the text of the inscription. 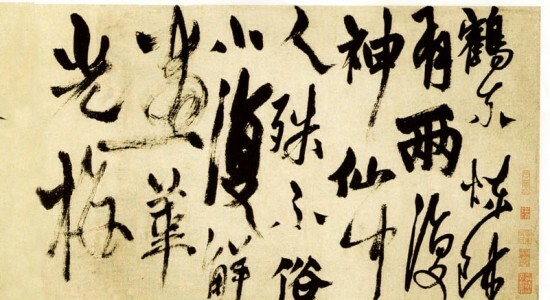 Liu argues that this contradiction can be explained by the calligrapher’s strategy to respond to the artistic challenge from the painter: whereas the text fulfills the social obligation, the personal style Yang chose successfully elevates his writing from a subordinate side note to an independent work of art. In this dramatic way Yang pays sincere tribute to his friend’s masterfully painted ink plum. This painting-inscription relationship, Liu argues, may be extended to real life suggesting an intimate, pleasant social interaction between the two artists. Unlike the energetic brushwork of Zou’s ink plum, Yang’s inscription on another handscroll, Leisure Enough to Spare (1360) by Yao Tingmei (fl. 14th century), appears bland and its content reads as disinterested. Compared to scrolls of “genuine” literati assemblies, as Liu points out in Chapter 2, the relationship between the inscriptions and painting of this scroll is more problematic. Although featuring prominent names like Yang’s, the project also involved obscure inscribers and a recipient who apparently did not belong to the prestigious circle of Yang and his literati peers. Furthermore, some poems read even irrelevant to the subject matter and may have been included only to fulfill social obligations. Liu’s painstaking reconstruction of the process of assembling the picture and inscriptions reveals a broader social milieu beyond the literati elites. The artistic participation of these local minor or quasi-literati is rarely documented explicitly but may be embodied in many extant works of literati art, which is indeed worth reexamination. Chapter 3 discusses a curious undated work, Bird and Peach Blossoms by Zhang Zhong (fl. 14th century), a disciple of Yang who died at a young age as stated in the inscriptions. The subject matter is nothing compelling and the composition simple, but every inch of the blank area is filled with inscriptions added at different times. Earlier inscriptions by Yang Weizhen and his contemporaries mourn the death of the painter, while later ones, added by early Ming dynasty collectors and viewers seemingly unaware of the original memorial meaning, shift their tones to celebrate the subject matter itself. The shifting perceptions reflect the changed social networks behind these inscribers and owners of this scroll. As Liu suggests, the scroll therefore should not be judged aesthetically as a mediocre painting but as a text-image “forum of community building” (p. 139) for the local literati coterie of different generations. Together, these case studies demonstrate the power of inscriptions over paintings. The intriguing relationship between words and images, as we can see, reflects the rich and complex dynamics of art-making in late Yuan literati society. But this was by no means a new phenomenon. In Chapter 4, Liu traces the history of painting inscriptions and argues that it was in the Southern Song dynasty that inscribing paintings came to be a significant form of social interaction following after the fashion of literary exchanges at the time. Since the Mongol conquest, Chinese literati inherited and reinforced this social art as a response to their political and psychological suffering. The issues that Liu raises in the dissertation echo the recent art historical debates on the revolution of Yuan painting, an influential art historical concept considering the formation of Chinese literati painting, with its unique brushwork techniques and distinctive aesthetics, as a sudden emergence in the Song-Yuan transition. As Liu and other scholars convincingly demonstrate, continuity, rather than revolution, may dominate the historical course (p. 171). The language of painting inscriptions is notoriously ambiguous and multivalent: allusions and metaphors are slippery to catch, and the original contexts are often elusive. Liu’s analysis benefits from her sensitive reading of nuances in literary tone: recognizing the sincerity in a seemingly arrogant tone (p. 55), or identifying a disinterested attitude in an elaborate signature (p. 72). All of these demand a discerning eye and a keen imagination. And it is through these close and critical readings that Liu is able to uncover subtle but significant discrepancies between texts and pictures; and to reconstruct the contexts which otherwise would be lost in the confusing voices of the poems. Liu’s inquiry in the dissertation reveals a more intricate word-image relationship in literati painting than the notion of the unity of the “three perfections” suggests. It also prompts us to rethink the definition of painting, a self-contained field and a cultural construct, which is now challenged by the fact that pictures are no longer at the center. Instead, the meaning of the scrolls in question was generated in the matrix of words and images. In this light, the relationships of artist, patron, and audience also demand an investigation in a fresh way. Overall, the critical examination in Liu’s dissertation shows a direction toward a more diverse, specific, intimate, and, at the same time, broader view of literati art, which would not only appeal to art historians, but also to scholars of Chinese literature and social history. Zou Fulei (fl. mid-14th century), A Breath of Spring. 1360, Yuan dynasty. Handscroll, ink on paper, 35.2 x 223.1 cm. Freer Gallery of Art, Washington, D.C.
Yao Tingmei (fl. 14th century), Leisure Enough to Spare. 1360, Yuan dynasty. Handscroll, ink on paper, 23.8 x 734 cm. Cleveland Museum of Art, Cleveland, OH. Zhang Zhong (fl. mid-14th century), Bird and Peach Blossoms. Yuan dynasty. Hangingscroll, ink on paper, 112.2 x 31.4 cm. National Palace Museum, Taipei. University of Kansas. 2011. 215 pp. Primary Advisor: Amy McNair. Image: Yang Weizhen’s inscription on Zou Fulei’s A Breath of Spring (1360). The Sitar: Symbol of India?